The Landice L870 Home ProSports Trainer comes with exceptional credentials. Almost no one would dispute Landice’s reputation as the goal to which all other treadmill manufacturers aspire. The company has made nothing but treadmills for over forty years, and they’ve made it an art form. At $4,500 the Landice L870 Home ProSports Trainer is definitely not a treadmill for everyone, but if you can afford it you should try it. This is a superb home treadmill. It has the quietest operation you can find and uses the best parts on the market today. What do you get for your money? 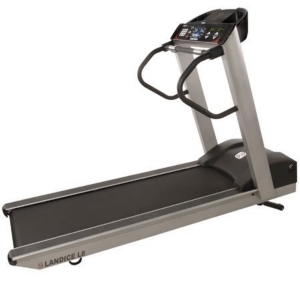 There is no other treadmill brand that matches the Landice for comfort. Even fitness pros admit that nothing compares to the “walking on air” feeling you get with Landice. It’s a result of the combination of the VFX shock absorption system, the hefty rollers (smoother feel and more consistent speed) and the 4-ply belt. 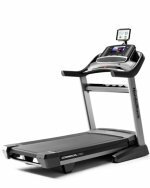 Here’s an interesting note from the world of treadmill repairs – many professionals say that if all treadmills were built like the Landice L870 Home ProSports Trainer, repairmen would be out of business. The 3.0 HP motors in Landice treadmills run quieter, stronger and cooler than others of the same size in rival brands. Could it be because they are made in the USA? Hard to tell, but repairmen admire them and loathe them at the same time. We try not to get sucked into the all-out praise for these treadmills, but we have to admit that the Landice L870 Home ProSports Trainer is pretty awesome. We did notice that of all the series offered by Landice, the ProSports line has the least impressive display console, but that’s like saying “the worst BMW.” It’s still pretty darned good. The aluminum frame is unique to Landice and we wish more brands would switch to it. The frame is lighter weight while being stronger and more stable; definitely worth a bit of extra money, especially if you’re going to be using the machine regularly for serious workouts. The Landice L870 isn’t for everybody. It’s simply too expensive for the occasional user or anyone who is on a budget. But if you are serious about your workout or have the extra money to invest in a treadmill that really will last a lifetime (they guarantee it! ), the Landice L870 Home ProSports Trainer may be what you’re looking for.